Mitch McConnell: FBI's Report Won't Be Made Public - Joe.My.God. 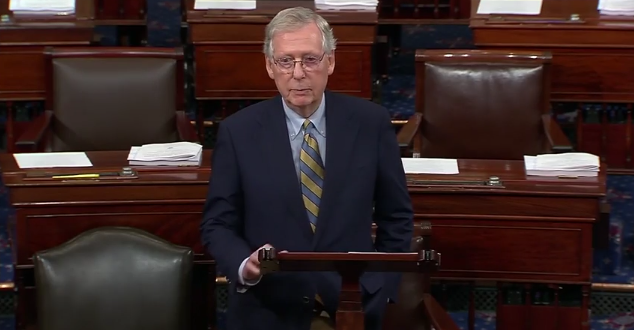 Mitch McConnell this afternoon said that only Senators will be allowed to see the FBI’s just-completed report on Brett Kavanaugh. “We’ll get an FBI report soon. It will be made available to each senator and only senators will be allowed to look at it,” McConnell told reporters. He added, “that’s the way these reports are always handled.” The FBI is investigating allegations that Kavanaugh sexually assaulted Christine Blasey Ford when the two were high school students more than three decades ago. Under a deal reached by GOP senators they have until Friday to wrap up their investigation. So I’m seeing that McConnell & Feinstein are both saying FBI results will be shared only with Senators & not with the public. If so, why? If the concern is non-pertinent invasions of privacy, can’t certain names be redacted? Senator McConnell: FBI report will NOT be made public.